A few months later, I met Lawrence Haley at the Fraley Family Festival at Carter Caves State Park near Grayson, Kentucky. Lawrence and I spoke with Bill Necessary, a musician who saw Ed and Ella all over the Big Sandy Valley when he was about twenty years old. He said they rode a train up Levisa Fork to Paintsville, the seat of government for Johnson County, where they spent the day playing music at the courthouse. From there, they continued by train to Prestonsburg, county seat of Floyd County. At times, they went into the nearby coal camps of Beaver Creek and played at theatres. From Prestonsburg, they took the train to Pikeville, the county seat of Pike County, and then continued over to the Tug River around Williamson, county seat of Mingo County, West Virginia. Lawrence didn’t remember going to all of those places with Ed but did remember staying with Molly O’Day’s family around Williamson. Bill said Molly’s widow Lynn Davis was still living around Huntington, West Virginia. Bill said Ed always wore a long overcoat — “rain or shine” — and even played in it. He never sang or entered contests. Back in Nashville, I worked really hard trying to figure out Ed’s bowing. There was a lot of contradictory information to consider. Snake Chapman said he bowed short strokes, indicating a lot of sawstrokes and pronounced note separation. J.P. Fraley, Slim Clere, Lawrence and Mona said that he favored the long bow approach and only used short strokes when necessary, like for hoedowns. Preacher Gore, Ugee Postalwait and Curly Wellman spoke about how smooth his fiddling was, which kind of hinted at him being a long bow fiddler. All were probably accurate in some respect. It seemed plain to me that one reason why there were so many contrasting and sometimes completely opposite accounts of how or even what Ed played was that everyone I’d talked to witnessed him playing at different times and places during his musical evolution. All along the way, he was experimenting, looking for that “right combination” or playing the style needed to create the sounds popular in a certain area. Even what I could actually hear on his home recordings was really just a glimpse into the world of his fiddling as it existed at that moment toward the end of his lifetime. I asked Roger if he knew anything about Asa Neal, the famous Portsmouth fiddler. Roger felt there were a lot of other good fiddlers in the area aside from Asa Neal and Clark Kessinger. 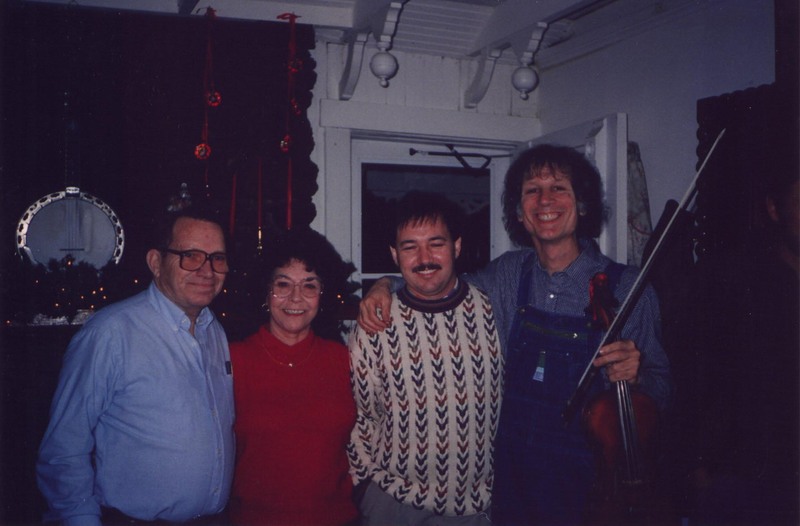 Roger recommended that I contact Abraham Keibler — a nephew to “those good fiddlers” — who took up the fiddle himself when he was around 50 years old. He also suggested John Lozier, an 82-year-old harmonica player who used to watch Ed play in Portsmouth. “He said Ed Haley was the smoothest fiddler he’d heard in his life,” Roger said of Lozier. We talked a lot about the old tunes played in eastern Kentucky. Roger gave me John’s telephone number just before we hung up. I put it away for later reference, trying to keep my focus on Ed Haley and not getting lost researching the fiddle music of eastern Kentucky in general. Lawrence Haley with his father’s fiddle, Ashland, KY, 1991. Photo by John Hartford. The cassette player was giving Slim fits. I used the opportunity to ask him more about Ed. His answers came swift and sure, leaving little room for doubt. Me: What kind of strings did Ed Haley use? Slim: Believe it or not — gut. He used an aluminum-wound A, an aluminum-wound gut D and a silver-wound G. Professional stuff. Me: Did Ed use a flat bridge or a round bridge? Slim: I would say a round bridge. Me: Did he ever talk about who he learned from or any of that? Slim: No, but I think Clark Kessinger stole some of his stuff. Me: When Ed played, was it loud? Slim: He played very soft. He wasn’t rough. I could hear Slim’s wife talking — she was helping him with the cassette player. Slim told her I was on the other end of the line and she got on the telephone and said, “Are you the one that does the riverboat things? I have seen you on Ralph Emery’s show. I have enjoyed you tremendously because you’re different.” That flattered me, of course, but I had more questions for Slim, who was still battling the tape player. Me: Did you ever hear Ed sing? Slim: No, but I’ve heard people say that he could play a guitar well. Me: Was he easy to get to know? Slim: He was a very congenial guy. You’d go around where he was playing, he’d hand you his fiddle. “Here,” he’d say. In other words, he was a very cordial guy. Me: Did you ever see him play away from his wife? Slim: He always had that woman with him. And when she played with him it seemed like she was straining to keep her eyes closed. She did not have a happy look on her, I remember that. But she played a Taterbug mandolin; they had a good tone. I asked Slim to describe how Ed looked. Slim remembered Doc Holbrook, although he didn’t necessarily equate him as Ed’s good friend. “Doc Holbrook is the one that loaned Clark Kessinger a fiddle to play on. See, there was years and years that Clark never did own a fiddle. And when Doc Holbrook wanted his fiddle back, Clark got mad at him for taking his fiddle away from him. Doc said, ‘You’ve had it all this time. Had a chance to buy it and never would. '” I wondered if this was the same fiddle that Ed had given Doc but Slim didn’t know about any of that. Curly Wellman had also recommended that I talk with Slim Clere, an Ashland-born fiddler whose telephone number I secured from a friend, Curly Fox. As I told him about my interest in Ed Haley, he was very rigid and formal; he kept referring to me as “sir.” Things loosened up once I mentioned the name Curly Wellman and asked if he had learned anything from watching Ed play. Slim said Ed had a unique bow hold. Slim remembered playing against Ed in a contest one time at the Paramount Theatre in Ashland during the Depression. Slim’s memories of Ed were broken up with stories about his own musical career. We knew a lot of the same people. I asked him again about Ed playing in contests — something no one seemed to remember in great detail. Slim said he bumped into Ed all over West Virginia. Back in Nashville, I followed up on some leads from Curly Wellman. I focused in on Molly O’Day, the famous singer who grew up hearing Ed’s music at her parents’ home in McVeigh, Kentucky. Snake Chapman and Lawrence Haley had both implied a strong connection between she and Ed. Named Laverne Williamson at birth, she initially used the stage names Dixie Lee and Mountain Fern. In 1941, she married Lynn Davis; the following year, she changed her name to Molly O’Day. During the 1940s, she was one of the leading female vocalists in country music. I definitely wanted to look up Molly’s widower the next time I was in Ashland. Mona was about fourteen years old when Ed made the dining room recordings at 17th Street. I had some detailed questions for her, since — unlike Lawrence, who was away in the service — she had first-hand memories of the whole experience. Me: And you played the mandolin on some of them? Mona: I don’t remember which one. I don’t remember but you can hear it in the background. Me: What kind of room were those records made in? Me: How big a room was it? Lawrence: Not very big. Twelve feet by twelve feet, I guess. Me: You put the recorder on the table and he’d sit up next to the table and play? Mona: Yeah, it was on the table. It was an old one where they had to brush the curls off the record. He wasn’t holding the fiddle over the table. Me: What time of the day were they made in? Mona: Different times. He didn’t make them all in one day. Lawrence: It mostly depended on when Ralph had the time, I guess. Mona: Yeah and — again — it depended on whether Pop felt like it. Me: Was he drinking during any of those records? Me: Do you think those records were a pretty good representation of how he played or do you think he played a lot better than what’s on those records? Mona: He played a lot better than what was on the records because some of them was a little too fast. You know, the speed on them. When he was in a good mood you could just hear the happiness in it. Me: So a lot of that’s not on the records? Mona: No, a lot of it’s lost forever. I asked Mona and Lawrence how they passed the day when they were young and traveling with Ed. 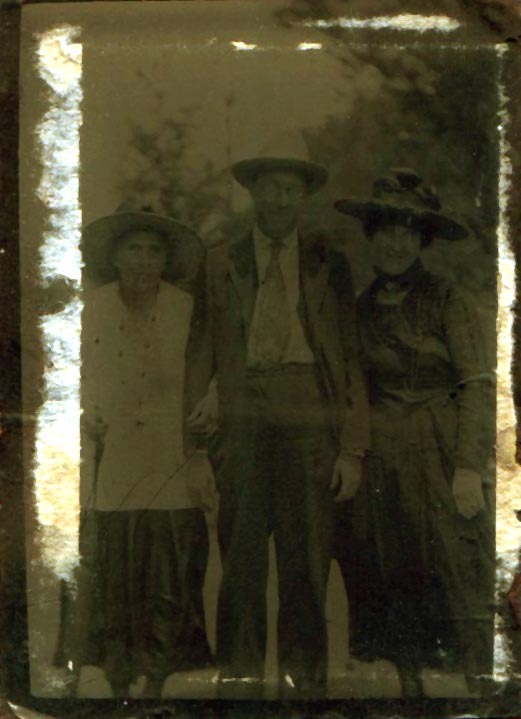 She and Lawrence said Ella kept a cup attached to the head of her mandolin to catch the money; Pop only put a hat out when playing by himself. He was very serious about his work, Mona said. “Or unless he was at a square dance and somebody would bring him a beer and that’d get him started,” Mona added. Mona remembered Pop getting in “a lot” of fiddlers’ contests but didn’t recall any specifically. She said he paid Doc Holbrook for her delivery with 25 dollars and a silver cup he’d won in a contest. “We never could get that silver cup back,” she said. Lawrence figured Doc’s son had the cup. I wanted to know more about Ed being in contests but everyone kind of drew a blank about it. Mona joked with Lawrence about a time they were in a contest as children. I got her to sing it for me. See my pretty ruffled dress. Okay — I was very curious. I reached my fiddle and bow to her and she showed me how Pop held the bow (little finger on top of the stick), then started playing “Over the Waves”. Her hands had an incredible economy of motion — almost as if they were “miniaturizing” the music. In watching her, I got a real feel for Ed’s technique and it was hard not to imagine Ed playing in a way similar to Vassar Clements. Mona clapped when I played for her but said I only played “a little bit” like Pop.